Chatham Light Welterweight Ricky Rose is set to make his second pro outing on June 14th, when he fights on the undercard of the Ian Bailey vs Mike Robinson International Masters Championship bout, at the Johnny Eames TRAD TKO Events promoted FAST & FURIOUS 2 – CAPITAL PUNISHMENT show at the Troxy in Limehouse, London. Just last month Ricky made a successful debut, scoring a resounding 40-36 shut-out points victory over London based Bulgarian Danny Donchev, on the esteemed Mr. Eames’ ALL GUNS BLAZING event. No surprise then that when Johnny started to put together the card for FAST & FURIOUS 2 – CAPITAL PUNISHMENT, Ricky was automatically included, even though it would be just six weeks after his maiden outing. Following a training session at the TRAD TKO gym in Canning Town, the chirpy former Royal Marine could barely hide his excitement when speaking about his upcoming second pro bout. “Yeah, finally got the debut out of the way on the 26th April. From the disappointment in March, from when I was supposed to making it, when I had to settle for an exhibition match, yeah finally got the debut out of the way with a good win and the next one is coming up fast, on the 14th June. Johnny (manager and promoter Johnny Eames) is moving me on quick, which is what I want, I want to be kept active, especially the first part of my career and until we start hitting the bigger fights you know. Tommy Martin’s a brilliant example of what can be produced here at the TRAD TKO, from early doors Johnny got him really active and on his eighth fight got him a title shot, hopefully my career will mirror this. I’m really looking forward to getting back in the ring on the 14th June, it’s again at the Troxy in Limehouse and yeah I can’t wait to show all my supporters what I can do again. 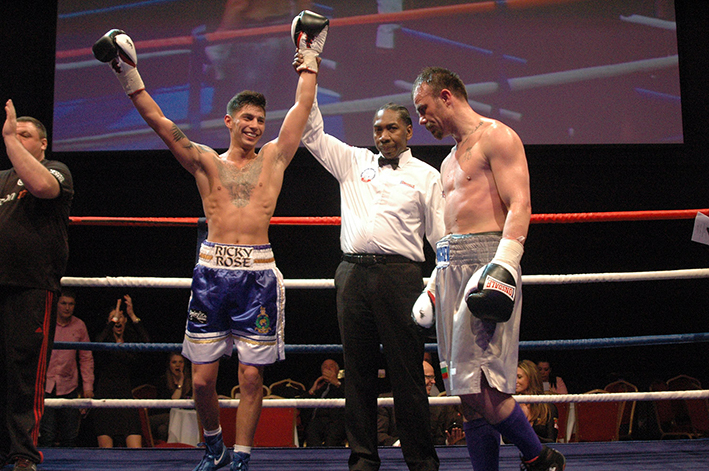 Ricky Rose, against an yet to be named opponent, features on the undercard of the Ian Bailey versus Mike Robinson International Masters Championship bout that headlines the FAST & FURIOUS 2 – CAPITAL PUNISHMENT that takes place at The Troxy in Limehouse, London E1 on Saturday 14th June 2014.